Emil "HeatoN" Christensen is a former Swedish professional Counter-Strike 1.6 player, formerly playing as captain of the gaming team Ninjas in Pyjamas (NiP). He is widely considered to be one of the best Counter-Strike players of all time. Christensen was part of the original Ninjas in Pyjamas team of 2001 which won the Cyberathlete Professional League World Championship that year. He and the other members of NiP went on to become the foundation to the highly successful SK Gaming, one of the most successful teams in e-Sports history. Christensen led SK Gaming to the World Cyber Games Counter-Strike Championship in 2003 and to 4th place in 2004. In September 2007, HeatoN quit playing Counter-Strike to be coach of NiP. He was then offered a chance to be a general manager for Stockholm in the Championship Gaming Series. HeatoN's CGS franchise is called the Stockholm Magnetik, representing him with a Counter-Strike: Source team, Dead or Alive 4 players, a FIFA 08 player and two Forza Motorsport 2 players. With the release of Counter-Strike: Global Offensive, HeatoN reformed NiP, with him functioning as the general manager of the team. In June 2016, HeatoN was announced to be the first-ever inductee into the esports hall of fame, the purpose of which is to preserve the rich history of competitive video games. HeatoN is presently ranked #1185 in highest overall earnings, and #74 in highest earnings for players from Sweden. Before HeatoN turned 18 years old, he earned $11,766.05 in cash prizes from 4 tournaments. 14.60% of his total prize money was earned before June 14, 2002. 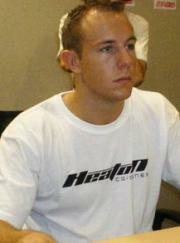 Out of the 34 tournaments awarding cash prizes that HeatoN had competed in, the largest amount was $12,000.00 from CPL Summer 2003 (Counter-Strike) on August 3, 2003. His 1st place finish makes up 14.89% of his total prize money won.